Using a special coating, the tiles appearance changes based on the viewing angle. The coating basically becomes transparent when seen directly but from the angle of the street, it looks like an average slate shingle or terra cotta style and it essentially camouflages the underlying solar cells. Musk said that they are working with 3M on the coating. The presentation also highlighted the fact that the tiles are hydrographically printed, making each one a “special snowflake.” This will allow two houses side-by-side to have the same style without a cookie cutter sameness pervading the neighborhood. The billionaire innovator also emphasized the durability of the panels and showed off a drop test comparison between his new tiles versus stone and clay. The solar roof held up better. Pulling out a nice buzzword that should be part of every tech presentation he said, “It’s never going to wear out, it’s made of quartz, it has a quasi-infinite lifetime.” Quasi-infinite baby. A new Powerwall was also presented. It has 14kWh of storage and 7kWh of peak power draw, along with a flatter external form factor. Version 2.0 will be able to power a four bedroom house for about a day on its own and will retail for $5,500. While it’s hard to get excited about a big battery that is just a little better, Musk sees the roof as the third part of his renewable energy eco-system. 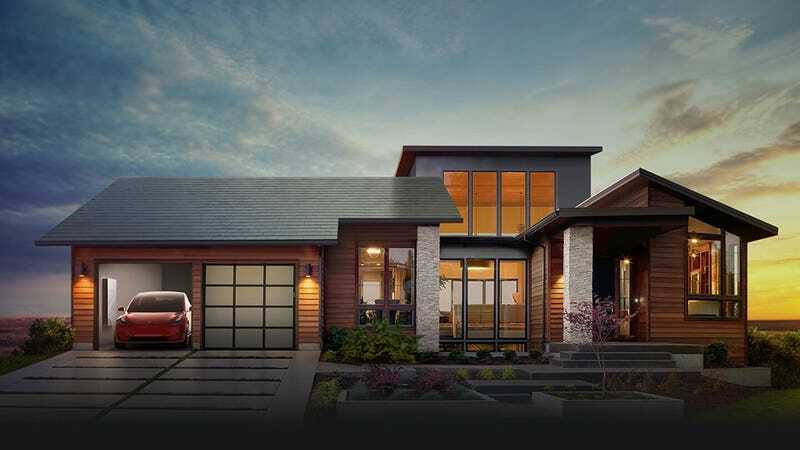 In his ideal world, you will power your house and charge your big battery with his pretty tiles, then you’ll plug your electric car into the big battery when you get home. “It needs to be beautiful, affordable, and seamlessly integrated. If all of those things are true, why would you go any other direction?” he asked. And he’s right that if all of those things are true, he will have an unstoppable collection of products. But, as of now, all of those things aren’t necessarily a reality. The tiles are beautiful and seamless if they fit your style of home and he did not announce what the price will be. Regardless, it’s almost certain that the holy trinity of personal electric power will be outside most people’s price range for the considerable future. Still, Musk is generally upfront about his targeting of the wealthy as early adopters in an effort to drive costs down. And Tesla is continuing to centralize all of the factors in electric power by partnering with SolarCity for installation. Shareholders will vote November 17th on a proposed $2 billion merger between the two companies.